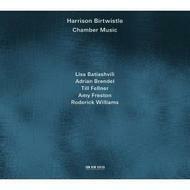 This album of Sir Harrison Birtwistle’s chamber music and songs, mostly of recent vintage, is issued as the innovative Great British composer approaches his 80th birthday (he was born in Accrington in July 1934). It features an exceptional line-up of performers. Heard together and separately is the trio of Austrian pianist Till Fellner, Georgian violinist Lisa Batiashvili and English cellist Adrian Brendel. They are joined by London-born singers, soprano Amy Freston and baritone Roderick Williams. The compositions include 'Bogenstrich', written in 2006 as a short piece in tribute to Alfred Brendel and first played by his son Adrian, together with Till Fellner. It was subsequently expanded into a cycle with the addition of settings of Rilke for baritone, cello and piano. The Trio for piano, violin and cello is the newest piece - premiered in 2011, it is a 16-minute single movement work of elaborate patterning, gestures and responses. Settings of the concise writings of US Objectivist poet Lorine Niedecker (1903-1970), scored for soprano and cello in 1998 and 2000, begin and close the album. As Bayan Northcott writes in the booklet, “These concentrated songs demand the utmost of their performers in precision, expression and timing. As in Webern’s settings, the few words and notes on the page can seem to imply whole worlds of thought and feeling”. This highly concentrated chamber-scale expressivity is felt throughout the entire album, recorded at Munich’s famed Herkulessaal, and produced by Manfred Eicher.